Li Datong, the Beijing-based political analyst who served as an editor at the Communist Party newspaper China Youth Daily and Ding Xueliang, the political analyst and a social science professor at the Hong Kong University of Science and Technology, shared their views on the President Xi Jinping's new lineup of the ruling Communist Party of China. MOSCOW (Sputnik) — A day after the 19th National Congress of the CPC concluded on Tuesday, Xi introduced five new members of the Politburo Standing Committee (PBSC), along with Chinese Premier Li Keqiang, at a press conference in Beijing and promised to work hard to be worthy of the trust from other party members. "Here, on behalf of the newly elected central leadership, I wish to express our heartfelt thanks to all other party members for the trust they have placed in us. We will work diligently to meet our duty, fulfill our mission and be worthy of their trust," Xi said. 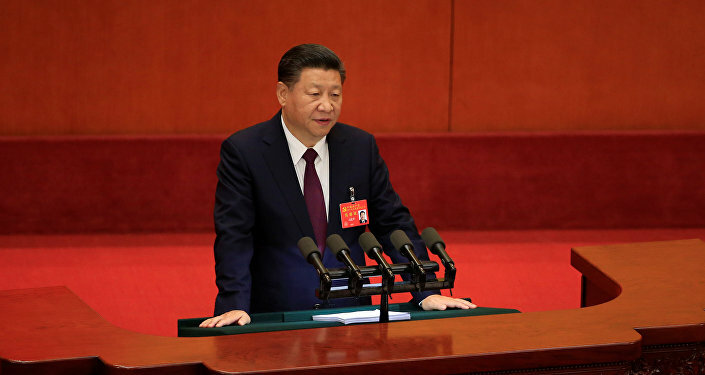 Xi’s doctrine of governance, known as Xi Jinping Thought on Socialism with Chinese Characteristics for a New Era, was enshrined in the revised CPC constitution released following the end of the 19th National Congress of the CPC. The inclusion of Xi’s name in the CPC constitution makes him the second Chinese communist leader to enjoy this honor while still serving as the party’s top leader, after the communist country’s founding father Mao Zedong, also known as Chairman Mao. Former Chinese leader Deng Xiaoping’s theory was added to the CPC constitution after his retirement in 1989. However, political analysts told Sputnik that the importance of adding Xi’s doctrine into the CPC constitution should not be overstated. "The CPC constitution is more like a piece of paper. It does not offer additional legitimacy. The real foundation for power does not rely on this. Whoever is in charge at the time could have a chance to revise the CPC constitution," Li Datong, a Beijing-based political analyst who served as an editor at the Communist Party newspaper China Youth Daily, told Sputnik. 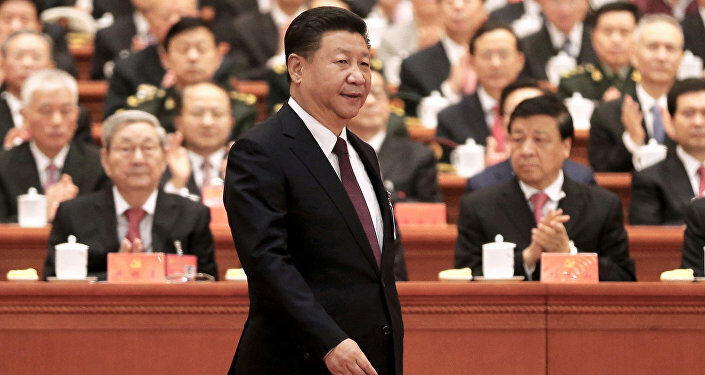 After taking over top CPC leadership as the party’s general secretary in 2012, Xi launched an ambitious campaign to lead the nation toward "the Chinese Dream of national rejuvenation," as he tried to establish authority in the world’s most populous nation. A key element of Xi’s campaign is his sweeping anti-corruption efforts that punished about 1.34 million grassroots level officials as well as tens of thousands of high ranking officials. While some applauded the anti-corruption campaign as critical to the CPC’s survival in China, many critics argued Xi selectively targeted his political opponents who dared to challenge his power in the party, including former security chief Zhou Yongkang and rising political star Bo Xilai, as well as Lin Jihua, a top aide to former Chinese president Hu Jintao. Beijing-based expert Li Datong suggested that after five years in office, Xi continues to face opposition from some CPC members. "If Xi wants to seek another term after 2022, I don’t think anyone would agree. Many people inside the party still don’t agree with Xi, because so many officials are living in fear every day. If you choose the wrong faction, you could face jail time easily. Corruption is so widespread that only those who picked the wrong side were punished," he said. After five new members of the PBSC were revealed Wednesday, a clear distinction from previous lineups was that all of new PBSC members were above 60 years old, which meant none of them would be fit to replace Xi as the top leader of the CPC by the party's 20th congress in 2022 due to age restrictions. According to unwritten traditions of recent leadership transitions in the CPC, a next generation of top Chinese leader usually gets elevated into the PBSC several years in advance before taking over as the general secretary of the party, as Hu Jintao did in 1992 and Xi did in 2007. And each new generation is expected to serve two terms, or ten years, after taking office. The new members of the PBSC would be too old to serve two consecutive terms from 2022, as PBSC members aged at 68 or older are expected to retire. Xi’s decision to not name a clear successor in the new PBSC lineup indicates that he has learned lessons on the restrictions an early successor appointment could have on the current leadership, political analysts suggested. "Both Mao Zedong and Deng Xiaoping appointed their successors multiple times and both faced a lot of troubles. The leaders after them have learned the lessons, because [appointing a successor] would put a lot of restrictions on the freedom of the current leader… Before making key decisions, you also need to consult with your successor to make sure you don’t hurt him," Ding Xueliang, a political analyst and a social science professor at the Hong Kong University of Science and Technology, told Sputnik. Despite his public image as a strong leader, Xi’s power in China has not reached the level of Deng or Mao, the Hong Kong-based scholar argued. "He still has a lot to do in the next 5 years before the next National Congress of the CPC to reach the goals in his heart," Ding said. Understanding China: Does Xi Jinping's Speech Signify a New Era? Communist Party Congress: Xi's Power Play, or Communist Reshuffle?